Decorated doors along main street in Lititz, Pa.A Moravian star hangs over the entrance. 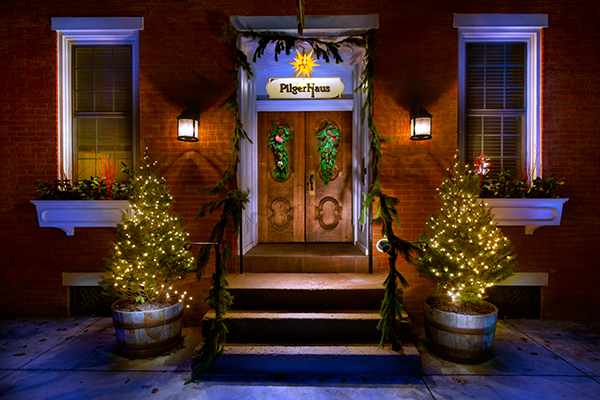 This entry was posted in Uncategorized and tagged Christmas, Glowing, lancaster county, Landscape, Light Painting, lititz Pa, Nostalgia, Photography, pilger house. Bookmark the permalink. I have to tell you how much I love your photography. Your sense of perfect lighting and shadow create a unique portrait for the viewers as if we are standing on the street with you. I also can see your sense of whimsy and drama and these movie like scenes entertain me and please me so. Places I may never see you take me to daily and I so appreciate your art. thank you so much.for all the effort it takes,its good to know someone is looking. I am one of those who thinks everything was better in the old days and maybe this is my way of stirring the imagination of the past.